I was pleasantly surprised when I received the communication from the Blogcatalog requesting all bloggers to Unite in the campaign against spread of HIV/AIDS. Yes, thats a wonderful idea as today the thinking people all over the world are seized of this killer scourge problem and are trying to widely broadcast the campaign so that it reaches the most affected. When I was actively serving the Tuberculosis patients in Ranchi TB Sanatorium, the then Doctor Maharaj of the Sanatorium – Swami Satyeshananda – used to impress upon me on how the TB had become intimately related to the HIV infections (while unfortunately the official circles would try to underplay the statistics). I realised the inter-connexion well when I came to South Africa last year and started associating with the welfare activities here, pioneered by a monastic brother Swami Saradananda who has been relentless in conceiving and executing suitable programmes for amelioration especially of the HIV/Aids infected patients in the KwaZulu Natal province which is said to have the highest incidence in this country. There are an estimated 33 million people with AIDS worldwide. It affects every country, city, and town in the world. And, the most frightening thing about it is that is going largely unchecked. In fact, that is one of the reason that worldaidscampaign.org is continuing its “leadership” theme, which it developed after learning that many leaders who promised to support AIDS were not keeping their promises. What’s the position in South Africa especially of the AIDS affected children? With many women who are HIV-positive still not receiving drugs that could prevent them passing HIV to their babies, HIV infections are alarmingly common amongst children in South Africa. According to UNAIDS, there were around 280,000 children aged below 15 living with HIV in South Africa in 2007. Children who are living with HIV are highly vulnerable to illness and death unless they are provided with paediatric antiretroviral treatment. Unfortunately there is still a shortage of such treatment in South Africa. The AIDS Law Project, an NGO based in Johannesburg, estimated that 50,000 children in South Africa were in need of antiretroviral drugs at the beginning of 2006, but that only around 10,000 were receiving them. UNAIDS estimates that at the end of 2005, children accounted for 8% of those receiving antiretroviral drugs in South Africa. As well as many children being infected with HIV in South Africa, many more are suffering from the loss of their parents and family members from AIDS. Once orphaned, these children are more likely to face poverty, poor health and a lack of access to education. How our Centre in South Africa stepped in…? During the 1980’s and early nineties prior to the first, free democratic elections in South Africa, violence in the Kwa Mashu area was at its peak. This resulted in many killings and deaths of parents leaving behind orphaned children. In addition, there were also many orphans due to their parents dying of HIV/Aids and children infected by HIV/Aids. The Ramakrishna Centre, here under the able leadership of Swami Saradananda mobilised its resources and engaged with Mrs BF Mhlongo from the Ekusizaneni Children’s Home, in K Section, Kwa Mashu to be of some assistance. At that time they had make-shift wooden cabins that were used for the children and during inclement weather posed many problems for them. The Centre immediately saw the need for good, secure and comfortable accommodation for these children and began a project to build two dormitories for boys and girls. 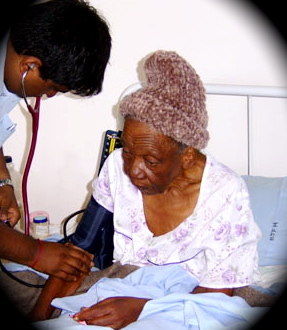 Recently the Centre took up providing indoor facility to terminally-ill patients. 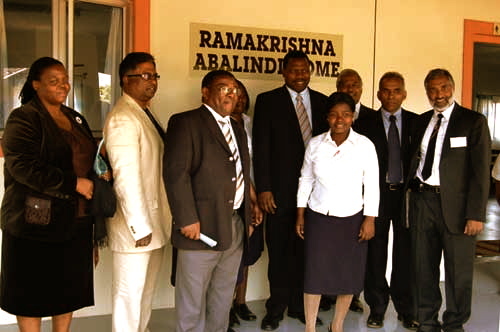 On 6 August 2008, the Ramakrishna Abalindi Home (Inanda) was declared open by the Hon. Dr Z L Mkhize (Minister for Finance and Economic Development, KwaZulu-Natal). This facility was built by the Ramakrishna Centre of South Africa and handed over on that day to the office-bearers of the Home. The Home, intended for terminally-ill patients, comprises three sections of 45 beds, made up of three wards (15 beds for males, 15 beds for females, 10 beds for children and 5 beds for mothers wanting to stay with their children), offices, stock rooms, ablutions facilities etc. The Home will provide a much needed facility for HIV-AIDS and cancer patients in the area. This is the second Home that the Centre has constructed for terminally-ill patients, the previous one being a 30-bed facility in Kwa Mashu. Minister Mkhize pointed out that the facility was not only a healthcare Home but also a symbol of integrated effort between Indians and Africans that promoted inter-racial, inter-religious and inter-linguistic understanding. Pranam at your holy feet. This was a lovely article Maharaj! I agree with the Blogcatolog when they asked that all bloggers band together in the fight against AIDS. Master’s (Sri Ramakrishna’s) work around the world is certainly making a difference to those afflicted by this horrible disease. Though I am a devotee of Master in South Africa, I myself was ignorant of exactly what projects we had undertaken so far as AIDS relief. It certainly is inspiring to know. Pranams and Greetings of peace Dear Maharaj ! Indeed your article has shed light on the great work that the Centre is doing in contribution to healing and bringing solace to the sufferers of this great disease. The selfless service and dynamic vision Of Swami Saradanandaji has been the great beacon of power behind these projects. 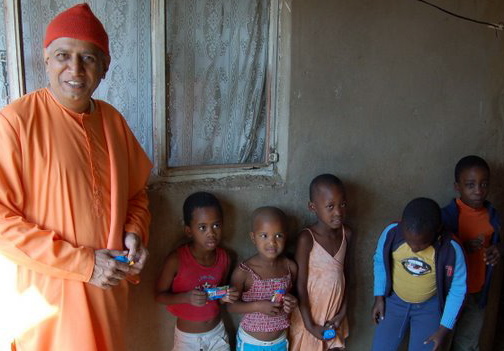 South Africa is blessed to have Maharaj and Swami Saradanandaji’s foresight and love. Our country is painfully struggling through this destructive disease, yet we have great men and women in our land that are dedicating their lives to the alleviation and treatment of HIV/AIDS. IF WE CHANGE THEN THE WORLD CAN CHANGE. May we pray for the peace of all the souls that are in pain. May we serve the people of our country with love and strength in our hearts. May Master bless all those that are faced with HIV/AIDS. As per the Gita Class tonight with Maharaj, May we reamin ever balanced through pain and joy and thus ever established in the self. These words are the first thing that came to my mind after reading this blog. Indeed Maharaj, its really a great job. These people needs help, support, medicine and above all care, love and affection. And Ramakrishna Mission is providing them all. I am really happy to learn the work done by the Mission in South Africa. My prayers and good wishes are there with all the suffering patients and their relatives. Thank you for the pertinent blog. So many of us are ignorant of this disease and its detrimental effects on family, community, and economy. It is devastating to read that 500 000 children are born with the virus each year and that South Africa has an estimated 5.5 million people living with the HIV virus, perhaps the highest total of any country. It is this sort of awareness about the disease that can empower the younger generation to protect themselves from its debilitating effects. We are thankful to all those who tirelessly work to bring relief and assistance to those scourged by this disease. Thank you Maharaj, for such an informative article. The HIV/AIDS Pandemic affects all of us either directly or indirectly. It is indeed heart warming to know that our Ramakrishna Centre is in the forefront of assisting our fellow citizens that are infected with this dreaded desease. Thanks to Maharaj, Swami Saradanandaji and the doctors that assist with this wonderful programme. My Dad together with Brothers Kirthy, Karthy, Don, Niri, Keveshen and Akshay visited Swami Saradananda at Phoenix on Saturday 06/12. They spent the entire day with Swamiji and witnessed the wonderful work done at the centre. My Dad mentioned the wonderful hospitality they received especially from Nirmal. He says that they all gained at least 2kg’s! 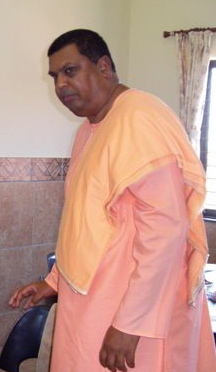 Hoping to meet Maharaj soon in Ladysmith. My salutations to Maharaj for this wonderful article! It was read with much emotion… at the same time it is a great consolation to note that Sri Swami Saradanandaji Maharaj, who like a tidal wave sweeps away the sufferings of the afflicted. This article is REALLY an eye opener as it shows the intensity of the Centre’s Involvement with regard to the AIDS Patients.